← who says pumpkin = dessert? one of my junior high teachers used to throw chalkboard erasers at students who were misbehaving. this sort of thing would probably result in a lawsuit in this day and age, but we just rolled with it – mainly because it was hilarious when you weren’t on the receiving end. now, i will be able to utilize the same strategy if the fella or any houseguests misbehave, because our home will be filled with chalkboards. 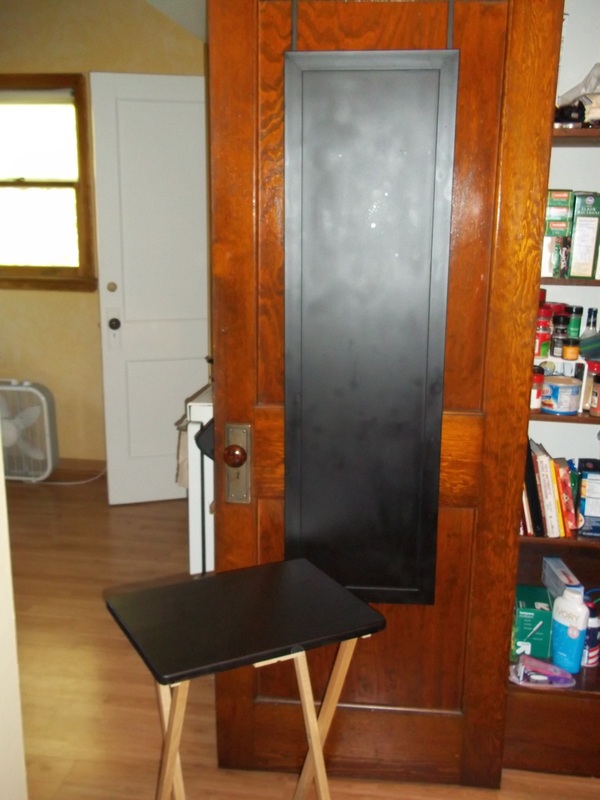 it all started with an idea from pinterest to make a pantry door chalkboard out of an over-the-door mirror. well, i did that, and then i still had chalkboard paint, and it was just so exciting…so i kept going. we have a set of cheap tray tables that look awful – i used them for oil painting so they are covered in paint. since they were cheap to begin with and they look awful, i thought hmm…wouldn’t it be kind of neat to have tray tables that were a chalk finish for writing down reminders, keeping score when playing cribbage without the board, etc.? and so instead of spray-painting just one mirror, i spray-painted a mirror plus the tops of three tray tables. now they have to “cure” for at least 24 hours, and then i have to cover the whole surface with chalk and erase, and they’ll be ready to go! This entry was posted in Fun Stuff, Home Projects and tagged chalkboard, fun stuff, furniture, home projects, spray paint. Bookmark the permalink.